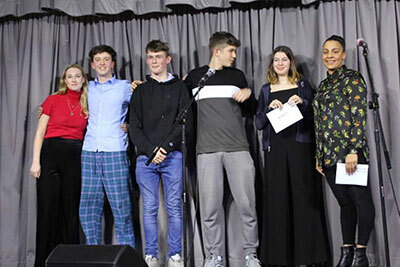 Thirteen young acts took to the stage on Friday night for the Heatham House Talent showcase. The event, organised by Achieving for Children, brought together all the music that is produced in the youth sessions at Heatham House Youth Centre in Twickenham, and other local organisations that use the centre. The young people, aged 11 to 19 years old performed an eclectic selection of music from afro-beat and rap to rock, soul and RnB. Their performances were reviewed by music professional from the 111 Collective. The Collective was set up in memory of Michael Nash AKA DJ Nasher who, as a young person, utilised the studios and DJ equipment at Heatham House and Powerstation Youth Centres. He went on to have a radio show on Kiss FM at the age of 17. And, despite his battle with an ongoing life-threatening condition, he spent his life connecting people and raising money for projects within the community. The judges included Froe, a producer from TMS, an English song writing and record production team who has an impressive credit list including the likes of G-Eazy, Jess Glynne, Emeli Sande, Ed Sheeran and Olly Murs. Xtrah, DJ and record label owner (Cyberfunk), who has worked with record labels such as Sony and RamRecords and Kidd Ivee, an MC, who had a show on KISS FM with DJ Nasher. All of them are local and went to Heatham in their teens. The event was split into two categories with the first half 'band' section being won by Love and Monsters, performing two of their own original pieces of music. The second half urban section was won by Franja, Kieron and Rhys performing their catchy track Saucy Step. Both acts won gift vouchers and an opportunity for studio time with TMS. “Heatham House has a long history of producing musical talent. And, I am thrilled that the current users of the centre have been able to perform and receive constructive advice from those already in the industry. “This event was about bringing some of the most talented young musicians in Richmond upon Thames together and give them the opportunity to perform for professional artists and producers. For many of them this is a once in a life time opportunity and for some of them, it is the start of an exciting musical journey.